BLACKSBURG, Va., Sept. 3, 2010 – For a number of years, the Virginia Tech Corps of Cadets has partnered with the Virginia Tech football team to highlight the Colors during the pre-game ceremony at every football game. Three football players are selected, because of their performance in the last game or during practice, to carry the American flag, the state flag, and the team’s spirit flag as they lead the team onto the field. They carry the flags the length of the field and deliver them to three freshman cadets at home games and one or two upper-class cadets at away games that are waiting for them on the south goal line. The cadets performing this honor are also selected based on their performance during their training. The cadets render honor to the flags and then securely carry them off the field. The first cadet to perform this duty for the 2010-11 football season, who will travel with the team to the Boise State game, will be Cadet 1st Sgt. 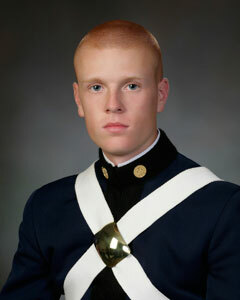 Jarrod Wilson of Huntingtown, Md., a junior majoring in geography in the College of Natural Resources and Environment. Enrolled in Naval ROTC, he is the first sergeant in Hotel Company and was selected for this honor as the top performing cadre member during the cadre and new cadet training weeks, where he excelled in preparing and then training freshman cadets. There are 32 freshmen in Hotel Company that he is responsible for, part of the over 350 member freshman class that entered training on Aug. 14.